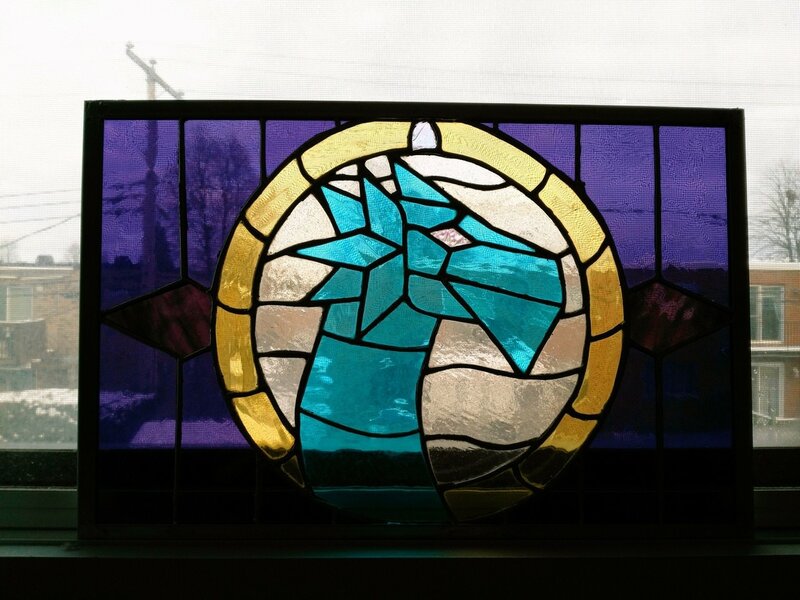 After 50+ hours, a dozen cuts, and an increased chance of getting cancer (from breathing in lead particles), I've finally completed my first ever stained glass project and present to you "Glint's Legacy". Enjoy! Allthou this is your very 1st Stained Glass; the Design and colorscheme is very nice. But please be exceptional carefull with lead indeed. Good ventilation against the fumes, and make sure that absolutely no lead ever mixes with your Blood; through cuts you gotten from Glass shattering/cutting. Yep, that's why I had a fan close by even though I forgot to do that once. We've been told that if anyone has health problems or plans to produce offspring they should see the instructor asap, which kinda makes me wonder what the alternative would be. The things you do to create fanart! Copperfoil technique(timeconsuming/expensive but more usefull for fine details and 3d shapes like a hanglamp or vase). Both methods seem equally hazardous for the creator thou. There is ofcourse some fantastic alternative(s) that are less Hazardous, less expensive, less timeconsuming; but still has potential for great results. Coincidentally; the author of this Idea happened to be a GW2 player. link below. Oh @Saphykun.3206 -- this is incredible! Thank you so much for sharing it. I'm curating for December's Community Showcase Live livestream, and I will be including this. It may not be Wintersday themed, but it'll fit the show nonetheless! P.S. Oh and I know that artist's are often seen as "sacrificing for their art" but ya gotta be more careful with those cuts!